Enzo Maccarinelli and Jurgen Braehmer. Trainer Gary Lockett says talks have begun about a rematch between Enzo Maccarinelli and WBA light-heavyweight champion Jurgen Braehmer. Maccarinelli has stated he wanted a rematch with Braehmer after losing to the German in Rostock on 5 April. 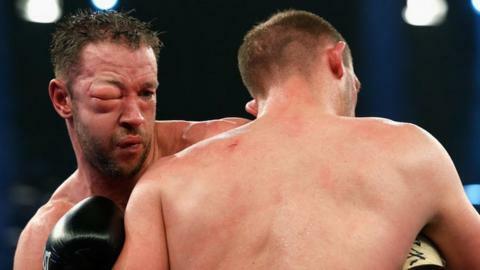 The Welshman's right eye closed after a clash of heads in the first round, but Maccarinelli opted to fight on before Lockett pulled his man out. "Talks started a couple of weeks ago," said Lockett. "Due to the unfortunate ending, with Enzo suffering the eye injury, it makes for an interesting rematch. "Enzo was giving it his all with one eye closed and he gave Braehmer something to think about and certainly got his respect. "We are waiting for the Germans to come back now, I know they are interested due to the viewing figures. "It's just about putting terms together and dotting the i's and crossing the t's and we will be away. "It's not certain yet and we are still waiting at the end of the phone and twiddling our thumbs but hopefully we will have some good news in the next couple of days." Southpaw Braehmer, 35, took full advantage of his opponent's eye closing and Maccarinelli was pulled out by trainer Lockett at the end of the fifth round. The defeat appeared to mark the end of the Swansea-born former WBO world cruiserweight king's bid to be Wales' first official two-weight world champion. The bout in Germany attracted more than 3.4 million television viewers and July is being suggested as a possible date for the rematch.